The more indefensible their restorations, the more museum regimes dig in and shut their ears to criticisms. (With bad restorations the eyes, too, often seem to have been shut.) 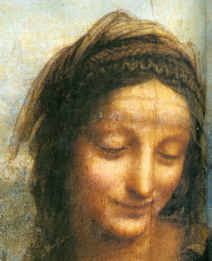 Given the controversial outcome of the Louvre’s 2011 restoration of Leonardo’s “The Virgin and Child With St. Anne”, it might seem a provocative defiance that the museum should so soon announce that it is not only about to restore another Leonardo (his “La Belle Ferronnière”), as was reported in the Wall Street Journal on 1 February 2014 (Da Vinci Code Red: Restorations Spur Debate), but also the desperately vulnerable “Mona Lisa”. Vincent Delieuvin, the curator driving (or heading) the restorations, makes a number of claims that lack foundation in the Wall Street Journal article. We had not dared to touch this Leonardo previously, he reportedly says, but now restoration techniques have improved to the point where the museum thinks them safe – even for the Mona Lisa which has become “yellowish and very dark”. The history of modern restoration is peppered with facile claims of technical “advances” that were rushed untested on to great works of art, soon to become the acknowledged follies of yesteryear. (We have often wondered whether the credulous techno-enthusiasts of Futurism, which movement died a swift death, had not migrated into art conservation.) Of what do these latest claimed advances consist? 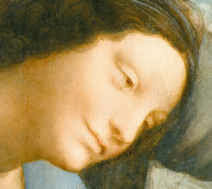 Have they arisen since the 2011 restoration of the “Virgin and St. Anne”, the controversial treatment of which provoked resignations from the restoration’s own advisory committee (as we reported on 28 April 2012 – “Rocking the Louvre: the Bergeon Langle Disclosures on a Leonardo da Vinci restoration”). On the “La Belle Ferronnière” Mr Delieuvin holds that “The many layers of darkened varnish added over the centuries are getting old and make the painting dark and yellowish”. Such phobic/alarmist language is a constant feature of the would-be restorer’s rationale. After restoration, Mr Delieuvin predicts, the “contrasts and colours will come out again; so will the feeling of movement”. A long-standing (French) charge against intrusive restorers was that in their haste to “liberate” colours and dispel all signs of age in what are old paintings, they remove original material and impart a falsifying, historically inappropriate modernity. Restorers of every generation have insisted that their “advanced science” can prove that no original material was lost. In so saying, they demonstrate cultural naivety and failures to comprehend the nature of that of which art consists and the artistic and art historical, not “techno/scientific”, terrain on which all restoration evaluations should properly be conducted. Restoration disputes stem from losses of perceived artistic values. Although artists certainly work with and through materials, the materials are not ends in themselves, or even vehicles of intrinisic value. Rather, they are the means by which the “stuff of art” is given fixed material expression. The currency with which artists work is values and the relationships between values. Through these they work by eye to produce artefacts which fix and carry their intentions, so that they might subsequently be optically apprehended by others. In the production of a painting every last feature is a product of thought. But every judgement, evaluation and adjustment is transmitted exclusively through human sight, and not, as techno-conservationists might prefer, through sub-atomic particles of matter, complex chemical formulations or other mystificatory hi-tech red herrings. When appraising restorations it is essential to do what museum curators and restorers are so clearly reluctant to do in their own catalogues and publications: place directly comparable photographs of before and after cleaning states in the closest possible proximity. This facilitates direct optical appraisal – which is the only methodologically sound and appropriate means of evaluating a work whose appearance has been transformed by a technician’s swabs, solvents, scalpels. It is never possible to compare a restored painting with its own pre-restoration condition because that is irreversibly effaced in the process. Photographs must therefore stand in lieu. In every photo-comparison shown here of details from the “Virgin and St. Anne”, it is clear to any educated eye that the tonal range that was formerly visible has been massively reduced. 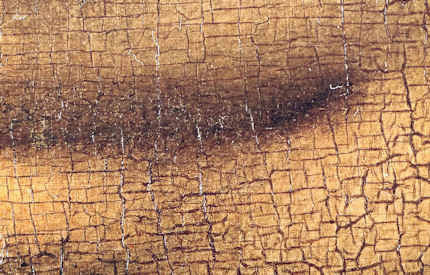 This, ipso facto, is a proof of artistic injury: “dirty varnishes” could not have disported themselves in such a manner as to enhance the effects of Leonardo’s own handiwork. Moreover, the values and relationships of values that were perceivable through the varnishes before restoration would, on Mr Delieuvin’s own optical schema, be expected to emerge from a “cleaning” with greatly enhanced, not reduced, power and vivacity – in short, while the lights would certainly be expected to emerge lighter, the half tones and darks should also be strengthened and not diminished – as seen right. Consider the comparison of the Virgin’s eyes at Figs. 5 and 6. Such has been the loss of modelling-by-shading that the face is reduced to a mask-like reminiscence of its former self. The now obtrusively dark slits of the down-cast eyes are no longer subsumed within the previous anatomically descriptive overall shading of eye sockets. 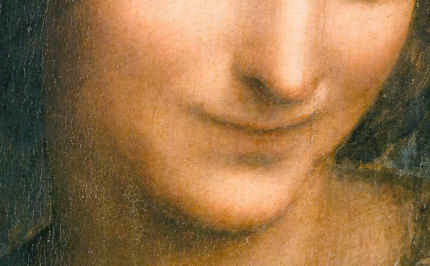 Had Leonardo really painted the face as is presented today as “recovery”, it would be for the restorers, curators and trustees of the Louvre to explain how it was that dirty varnish had formerly imparted superior, Leonardesque traits to the master’s own handiwork. 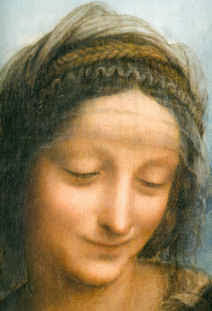 It would also need to be explained why Leonardo might have been content to leave two versions of the pupil of the Virgin’s right eye simultaneously visible on his finished picture. If we consider the comparison shown at Figs. 7 and 8 of the Virgin’s lower face, another aspect of injury is apparent. That is, as the half-tones have receded under the force of swabs and solvent, the resulting increased zones of brightness leave the face looking looks both fatter and flatter. It is hardly heresy to suggest that Leonardo used shading to turn the surfaces of his heads away from light and into shadow. What kind of benefit, then, has been gained by delivering a lighter, brighter, flatter Leonardo? For what reason and on whose authority was the expression of the Virgin’s mouth altered? 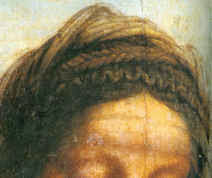 As our colleague at ARIPA, Michel Favre-Felix, disclosed a few years ago, in the Veronese head shown in Figs. 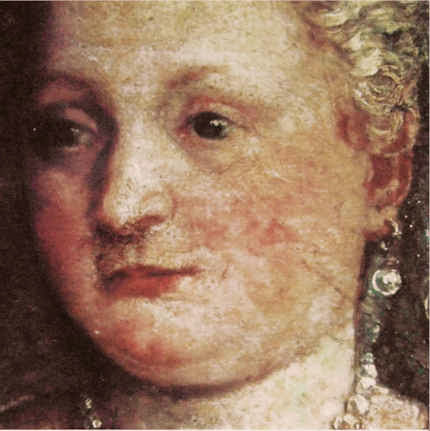 10 to 13, we find evidence of a Louvre house-style of cleaning and repainting that imposes crass puffed-up modernist forms and redrawn and re-modelled features on Renaissance heads. This bizarrely unwarranted policy is accompanied by a cavalier disregard for the norms of museum-world conservation record keeping (as is evident in the Louvre spokeswoman’s reported comments at Fig. 11). The Louvre, as today constituted, is doing indefensible things to the art it holds and feels no obligation even to record or report them. The tragedy is that until quite recently this museum was a model of restoration restraint and a reproach to other institutions. 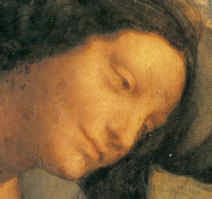 Today, along with with its bonanza of destructive restorations, increasingly we find intrusive and vulgar commercial exploitation by Big Sponsors: “Another Restored Leonardo, Another Sponsored Celebration – Ferragamo at the Louvre”. To think that such a great institution could sink so swiftly into meretricious stewardship and displays of bling. Above, Figs. 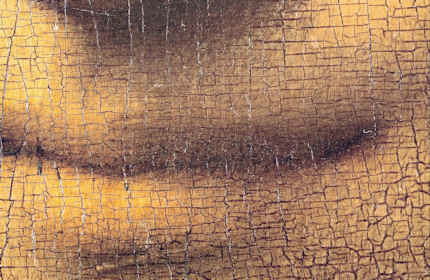 1 and 2: Details of the mouth of Leonardo’s “Mona Lisa” showing the badly fractured “topography” of the paint and varnish layers. In view of the results shown below of the recent cleaning of Leonardo’s “The Virgin and St. Anne”, it is impossible to consider the prospect of a restoration of this painting with anything other than absolute dread. By what means might an attempt be made to separate the infinitely subtle brown modelling of the mouth from the ancient varnishes in which they are presently incorporated? Above, Figs. 3a and 3b; Figs. 4a and 4b; Figs. 5, 6, 7, and 8: Comparative details of St Anne in Leonardo’s “The Virgin and St Anne” showing the head before and after its recent “cleaning” and “restoration”. In each pairing, the before cleaning state is either to the left or above the post-restoration image. Above, Figs. 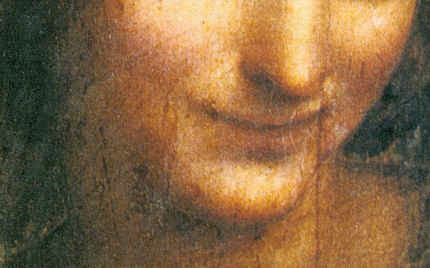 9a and 9b: The head of Leonardo’s Virgin shown before (left) and after (right) treatment. Above, Figs. 10, 11, 12 and 13. 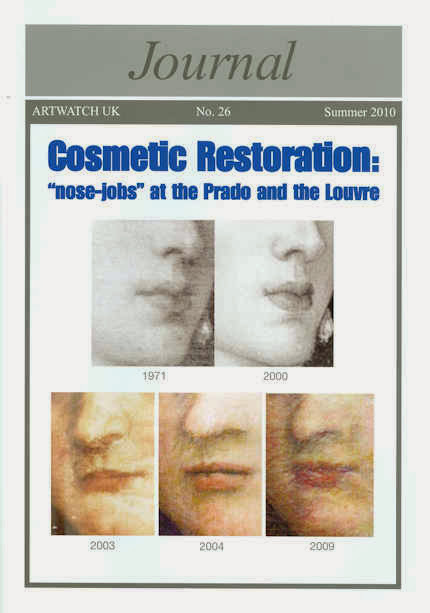 Fig 10: The cover of the Artwatch UK members’ journal which discussed recent botched restorations at the Prado and the Louvre. Fig. 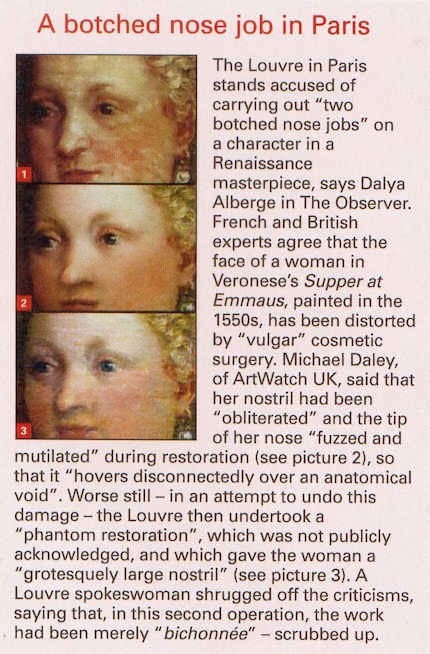 11: Coverage in The Week of Dalya Alberge’s 13 June 2010 Observer article “Louvre masterpiece by Veronese ‘mutilated’ by botched nose jobs”. Figs. 12 and 13: The Louvre’s mutilated Veronese head before (top) and after (above) its covert and unrecorded double restorations. Below, Figs. 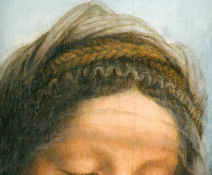 14a and 14b: The mutilated Louvre Veronese head (left), and the homage to the “Mona Lisa” by Botero (right) to which the several-times adulterated Veronese head now bears a strong resembance in its puffed-out forms. This entry was posted on February 4, 2014. 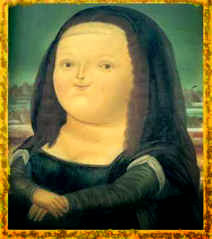 It was filed under blog and was tagged with "Veronese Nose-jobs", Art History Today, Botero, Botero's Mona Lisa, Cosmetic restoration, Dalya Alberge, David Packwood, Futurism and Conservation, Leonardo's "Mona Lisa", Leonardo's "Virgin and Child with St Anne", Leonardo's La belle Ferronniere, Lwonardo da Vinci, Michael Daley, Michel Favre-Felix, Nose jobs at the Prado and the Louvre, Restoration disputes, The ArtWatch UK Journal, The wall street Journal, Vincent Delieuvin.